Joint Project - Special Coatings for Honda Formula 4-Stroke Racing Boats. A little while ago we were contacted by D.S. Developments UK who manufacture Neptune Waterproof Communication Equipment. They work on various Honda Formula 4-stroke power boats and sponsor H4 (pictured above), and had been wondering about putting some kind of water repellant coating on the bottom of their boat. Having found us on the internet and seen that we supply most of the leading sealants, they phoned us to ask us if we had any ideas or suggestions. We are always full of bright ideas and find these kinds of problems challenging, so although boats aren't usually 'our thing', we decided that we would see if we couldn't help them to find a race winning advantage. 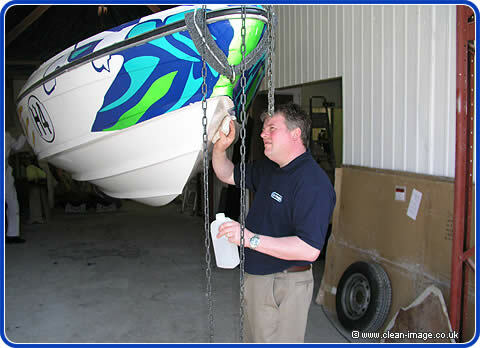 We suggested buffing the bottom of the boat so that it was ultra smooth and then coating it with a water repellant chemical such as Rain-X, Rainscreen or maybe a sealant such as Diamondbrite. But we weren't sure if these products would be up to the job - Diamondbrite could certainly stand that kind of punishment, and Rain-X would certainly repel water, but what we really needed was a hardly, long lasting and highly water repellant coating that would last a whole race being pounded with salt water at speeds of 60mph. Everybody lends a hand to finish the 150 class. We had a product on the way to us called Rain-Away which is very similar to Rain-X but lasts longer, so we contacted Willy 'The Buffmeister' Winterfalk of Allbrite Europe and asked him just how long he could make the stuff last? (Willy is an expert on buffing and has developed the AllPad system, the results of which can be seen in several of our articles). Rain-Away is normally put on windscreens and windows and so a primary requirement is that it goes on clear without leaving smears. Luckily Allbrite could mix other chemicals into solution to make it last longer without worrying about it leaving smears or being hazy as these are not glass bottomed boats. Gary applying the new, and as yet nameless formula, although I have given it the nickname 'Barnacle Juice'. Willy worked with J.J. from Allbrite U.S.A. who made up solutions and applied them to fibreglass and then sprayed them with saltwater through a pressure washer. After a month of testing in the labs in California they felt they had an answer. So Willy flew over to England from Sweden and while we took Willy down to Surrey, Allbrite's UK distributor (Autobright) met us there with the products. 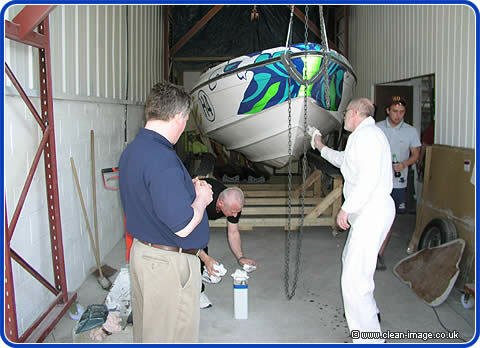 The plan was for Gary from Clean Image and Donna and Geoff from Autobright to help Willy buff the bottom of the boats using a fibreglass polish especially developed by Allbrite for the task. But upon inspection of the hulls, it was decided it wasn't possible to make enough of an improvement to make it to warrant spending the time -- we are throwing around some ideas and although fibreglass is notoriously difficult to work with we hope we can offer some suggestions to get the bottoms of these boats as smooth as glass. Donna and Geoff inspect the hull once the formula is dry -- it actually feels wet and oily even though it is dry and doesn't come off on your hand, it's a strange sensation. We all chipped in and coated the boat's hull in version 1 of the formula after cleaning it with a special fiberglass cleaning fluid. This particular boat driven by Vernon hunt, had just set a speed record for a 150 class at Southampton with the Sat-Nav clocking a speed of 56.9mph. We hope that the new coating will make it go even faster, but for now we will have to wait and see. 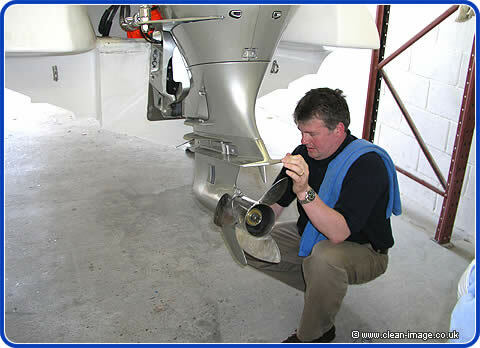 Gary treats the gear housing (you can probably guess that I haven't learnt the nautical terms for these things yet). This powerboat will be at the Lowestoft Boat Show on the 13th and 14th of May and for a small fee you can take a ride - money raised goes to Waveney Sailability and the East Coast Child Appeal. In the mean time, it's on display at Lings Honda of Lowestoft.